Update: The Huawei P Smart now has newer competition from the likes of the Moto G6, and Android 9 Pie is still nowhere in sight for it. However, it remains a strong affordable option. 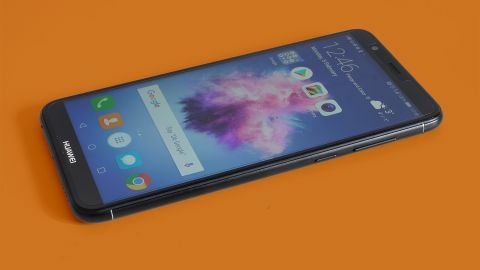 The Huawei P Smart is part of a wave of phones that seem similar to those released six months earlier but have an ultra-wide (or long) screen. It's also very similar to the Honor 9 Lite, but has an aluminium back instead of a glass one. It doesn't have an ultra-high spec camera or a killer chipset, but is a quality phone sold at the right price. You'll save a lot of money over a 2-year contract with a Huawei P Smart. Huawei has managed to blend the right level of specs with an eye-catching price tag, which makes the P Smart an enticing budget buy. The Huawei P Smart originally launched as a Vodafone exclusive in the UK, but its availability has since widened and you can pick it up for a tidy £143.99 (around $190, AU$250) SIM free. Compared to other Vodafone devices at the price, this makes the Huawei P Smart a killer deal. Competing picks are the Huawei P8 Lite and Vodafone Smart N8. The Huawei P Smart is better than both. Looking wider, other alternatives include the Samsung Galaxy J5, a conspicuously lesser phone in some respects. The models we'd recommend considering too include the Moto G6 and Honor 9 Lite. The Huawei P Smart is a relatively low-cost phone, one that competes with models like the Moto G5S Plus and Honor 9 Lite. Its most important feature is an 18:9 aspect ratio screen, which leaves less blank border above and below the display. You get more screen inch per inch of phone with this now-common design. It also has a construction style that, like the Moto and Honor, isn't that easily distinguished from a more expensive phone. The hardware inside is that of a low to mid-range device, though. It has an octa-core chipset without the blistering performance seen in more expensive rivals. And while the Huawei P Smart has dual rear cameras, the 13MP and 2MP array won’t get you the image quality or level of background blur effect an iPhone XS would. However, almost every little compromise in the Huawei P Smart is easy to accept as long as you keep your expectations in line with the price. The Huawei P Smart's job isn't to excite you like an iPhone XS or even an Honor 10. It just needs to look and feel good enough to make spending 3-4 times the price seem silly. Huawei has done a good job of dressing up what is at best a mid-range construction as something high-end. Let's deal with the back first. The rectangle bordered by the two bright silvery strips is anodised aluminium. But above and below it, the end caps are plastic. It's the kind of compromise you'll only notice if you go looking for it, but this makes the Honor P9 Lite a higher-end design than the Huawei P Smart. Its outer is all glass and aluminium. The Huawei P Smart also has a mix of up-to-date and older hardware features. There's a very good fingerprint scanner on the back. It's significantly recessed, so you can't miss it, and works quickly. However, the Huawei P Smart also has a micro USB charge socket rather than a USB-C. While the main real-world benefits are simply being able to plug it in either way around, and support for future USB accessories like headphones, it does seem dated at this point. There's a headphone jack too, which some of you may well have traded a USB-C away for anyway. The Huawei P Smart is not water resistant and doesn't trim down the screen surround as much as some recent, more expensive phones. But it's otherwise very easy to live with. The phone is narrower than a Moto G5S and is easy to handle. At 7.5mm thick it's also slim. Very wide aspect screen phones like this make you reconsider what a 'big' screen size really is. The Huawei P Smart has a 5.65-inch screen but in handling terms the phone is similar to one with a 16:9 5.2-inch screen. Its screen uses an IPS LCD panel with a resolution of 1080 x 2160, the same as just about all lower-cost 18:9 aspect phones. Color, contrast, sharpness and brightness are solid. For some reason a couple of apps seem to run at 720p, but that's the software's fault, not the screen. Ultra-deep color is what you miss compared with a more expensive phone. Tones look fairly natural and well-saturated, but comparing the Huawei P Smart with the 'DCI P3' cinema mode of the HTC U11 Plus, the more expensive HTC's screen is richer still. You can't fiddle with the Huawei P Smart's saturation or contrast, but there is a color temperature control. Different eyes will prefer different tweaks. We quite like the phone with a slight warm skew.